I’m not talking about somewhere in outer space, I’m talking about right here on earth – in your town and mine. And it’s not just people. The bottom of the “brain chain” here in Nashville is occupied by the squirrel. Not squirrels in general. Some of those guys are actually quite clever. No, I have a particular squirrel in mind. On the so-called “evolutionary scale,” he would fit somewhere between a one-celled organism and a tree stump. No matter where you drive in the Nashville area, you will see this little guy. And always in the same position: lying in the middle of the street asleep. Squishy is a fairly average-looking squirrel. Not too large, not too small. Just average. 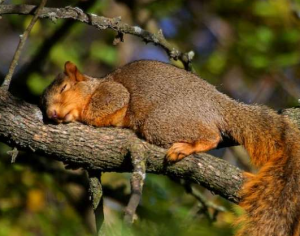 But Squishy is a bit more lethargic than the average squirrel. I’ve never seen him running, jumping, or climbing as squirrels do. Not Squishy. He seems unable to overcome inertia. Sometimes he’s sleeping on his back; sometimes on his stomach with his legs splayed out; sometimes on his side. But always right out there in the road! Squishy just doesn’t seem to be the brightest representative of the order, rodentia. And I don’t know if it is because his “headlight” doesn’t shine so brightly, or because he is actually quite fearless, but nothing seems to rattle him. Cars coming directly towards him – even rolling right over him – don’t seem to faze him one bit. Nothing bothers him. Nothing chases him out of the street. And nothing – NOTHING wakes him up! And yet…and yet I SEE HIM EVERYWHERE! ALL OVER TOWN! I’ve sometimes seen him in several different spots just driving down a single strip of highway. You never see him move, but he is able somehow to get all over Nashville and its suburbs, and almost in the blink of an eye. It’s really uncanny. Occasionally (and this without his ever waking up or moving a muscle) I’ve seen large black birds who seem to be standing guard over him. So perhaps he has his own security detail. And if he can afford his own security detail, maybe he has modes of transportation we know nothing about. Come to think of it, I believe I did see a man loading him into a truck one time with a shovel (presumably to give him a ride). So maybe Squishy is a whole lot smarter than he seems. That would make sense. Because lately I’ve seen a number of other animals trying to imitate his routine – raccoons, groundhogs, even armadillos! I’ve even seen possums, but they already “play possum” pretty much anywhere, so who knows? Sleep on, Squishy, sleep on.